The SILKS spatial modules have various GIS tools for easy navigation and simple data querying such as zoom in, zoom out, zoom to full extent, selective zoom, re-center tool, pan, distance measuring and print map tools. Features on the map can be identified using Map Identify tool. Distance measuring tool of map also have been included as part of spatial map analysis tool. Results of map query or area of interest can be printed out along with detail legend using Print tool. The size, font type and map output can be customized using this tool. The map can be produced in various file formats such as PNG, JPEG, GIF or PDF. Region specific zoom is made possible using QuickZoom tool. There are various navigation tools for map navigation and control such as zoom in, zoom out, zoom to full extent, selective zoom, re-center tool, pan, distance measuring and print map tools. Features on the map can be identified using Map Identify tool. Distance measuring tool of map also have been included as part of spatial map analysis tool. Results of map query or area of interest can be printed out along with detail legend using Print tool. The size, font type and map output can be customized using this tool. The map can be produced in various file formats such as PNG, JPEG, GIF or PDF. Region specific zoom is made possible using QuickZoom tool. Searching of non-spatial attributes can also be performed by the users. To do this, user first selects a layer and then a field from its listed fields/columns. An attribute to be searched is entered in the textbox. 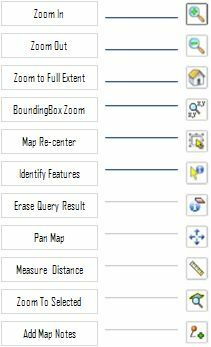 Clicking the ‘Search by Value’ will create a pop-up window listing the attribute table matching the search criteria and subsequent zooming in the map and highlighted.